…Is there any reason to keep any Egyptian government official in power? Beijing and Pyongyang have “lips and teeth”, but Egypt’s Hosni Mubarak and North Korea’s Kim Jong-il have ballistic missile sales, according to Don Kirk. Progressives need a policy clue about North Korea that doesn’t start with tedious talk about negotiations. Meetings are on again – boring, been there, done it to death! This isn’t news, it’s a sleeping aid. Refugees aren’t all that exciting, either. 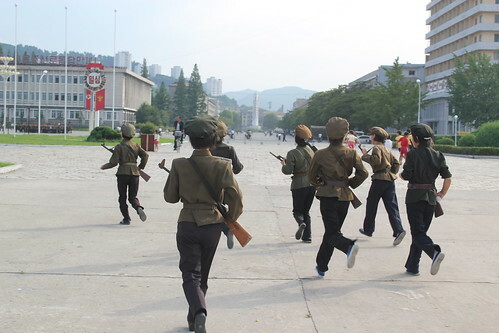 31 North Koreans got near Yeonpyong Island, or else no one would have cared. How many South Koreans care about the refugees already in South Korea? It’s hard not to yawn. North and South Korea have agreed to hold preliminary military talks on 8 February, in an attempt to defuse heightened tensions on the peninsula. South Korea’s President Lee Myung-bak urged the North to seize a “good chance” to improve relations. The Koreas will discuss the two deadly attacks by Pyongyang against the South, which killed a total of 50 people, Seoul’s defence ministry said. The talks may lead to a more senior meeting, possibly at ministerial level. Lee Byung-Chul argues that Beijing has a lot more to do with North Korea’s “peaceful” overtures to South Korea than previously thought. One of the lessons of this episode is that despite professions of inability to control its client state, China appears now to have demonstrated unrivaled leverage on the North in terms of economic, political and military intervention. In addition to supplying substantial amounts of aid including 90 percent of the North’s oil at sharply lower “friendly prices,” China has co-opted and trained a pro-Chinese cadre of North Korean functionaries and elites in the hopes that they would become collaborators under the coming regime of Kim Jong-un, Kim Jong-il’s son and presumptive heir. So Beijing is no longer hiding its solid hold over the North. The Economist applies the example of German unification to the Koreas‘ Sisyphean task. Drawing on the two courses open to it, massive handouts or immigration, the weekly recommends Seoul split the pain and the difference. If the Koreas reunified, the government would face a stark choice. It could try to fill the gap in living standards between North and South, through handouts, public investment and subsidies. Or it could brace itself for heavy migration, as poor Northerners moved to the South in search of higher wages. [Caption]As discreet developments, the easing of travel restrictions and troop desertions are remarkable, even a moment to cheer; together they start to worry. Firstly, Andrei Lankpv narrates the slow erosion of North Korea’s restrictive travel visa system.